All prices in U.S. dollars and are cruise/land only. All reservations are subject to Brand g's Terms and Conditions. Initial deposit is $850 per person, with final payment due March 7, 2019. Price is per person based on double occupancy. Port fees of $199 and gratuities of $175 are additional. Single Supplement for Cruise is $2500, limited to categories A, B and C.
Your all-inclusive adventure begins in Indulge your passion for food, history, and music as you discover the warmth of Portugal and Spain. Experience the “sunny side” of Europe, starting in radiant Madrid, then follow the Douro River through Spain and into Portugal. Feel the warm sun on your skin as you cruise past terraced hills, quaint villages and acres of ripe vineyards. From taking in a traditional flamenco show to memorable local food and wine tastings, this all-gay Brand g cruise and tour gives you the very best of the region. 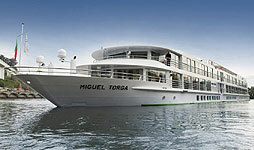 Transfer from Madrid to ship in Vega de Terron, with stop in picturesque Salamanca. Onboard special highlights including cultural performances, educational discussion forums, theme dinners and ship tour.